I actually read this book a few months ago, but the surreal nature of it has lingered on my mind ever since. It's a funny kind of novel – distinctive, somewhat familiar, odd in all aspects – and if you were to ask me why I love it so dearly… I wouldn't be able to tell you. 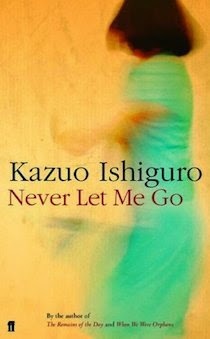 Kazuo Ishiguro has crafted a fragile novel that I read with great caution; perhaps under the impression that, with one turn of the page, I could break it, shattering a world that is a blur of own. MY THOUGHTS: Never Let Me Go will not be for everyone. Yet there will be some who just get it; some who are immediately entranced by the slow, sleep-inducing metronomic flow of words; some who will fall to sleep the night after finishing, with echoes of Hailsham littering their dreams. Never Let Me Go will not please the entire crowd of dystopian-lovers, just the few of them who want brilliant prose and a subtle element of darkness. But, perhaps the most fascinating element of this novel is Ishiguro's characterisation as characters are rarely - if ever - quite as human as they are in Never Let Me Go. Which is incredibly ironic given their formulaic upbringings; the isolated Kathy, the manipulative Ruth, the manipulated Tommy have all been broken by the society in which they live: a society which arouses some questions about our own. Kathy's narrative is fragile, and the clarity with which she regards the past is questionable… Ishiguro has created a protagonist, whose voice is rich and true-spoken, and yet confused and splintered. All in all, I really cannot recommend Never Let Me Go enough; like I said to begin with, it won't be for everyone, but if you want a refreshing narrative and a prose which raises many philosophical questions, you should give this a go. Ishiguro has this very odd way with words… his words evoke incredibly strong images, memories and feelings. Everything about his version of contemporary England is strangely nostalgic and recognisable – which I guess adds to how unnerving the whole novel is. I read Never Let Me Go a week or two ago after I heard you talking about it (I think you mentioned it in a blog post or something) and I definitely get what you mean. After I'd finished reading I actually had a dream about it so it obvious;y made a big impression on me! I love how at the beginning we think Hailsham is just a private school, and how Kazuo Ishiguro slowly reveals the whole (sad) story. I have one of his other books...can't remember which one, but I'll definitely try find the time to read it soon. Lovely review, and I second your recommendation! Yes, I think I recommended it awhile back, a few days after finishing! xD I'm so glad you enjoyed it Maya, and I totally agree about the slow revealing of the bigger picture. :) I've actually put a few of Ishiguro's books on my Christmas list. Interesting..... I'm not sure if this book is for me. I guess it depends on the mood I'm in when I read it. Sometimes I find philosophical thoughts irritating but I'm open to trying this book. Haha, yeah, I get what you mean! I always see raving reviews of books like The Selection and even though I know I'd hate the book, the reviews always tempting! Fantastic review, Ruby; yours are always one my favourite to read! This sounds like a brilliant book, I've seen the film and have never sobbed so much during one before so, really am going to try and get my hands on this! Ruby, you always make such incredible reviews - DESPERATELY NEED TO READ THIS!!!!! Aw thank you – glad you like my reviews! I love the way you've described it! I'm fascinated with it's slow pace, great world building and characterisation. Sounds like a book I'm going to have to check out. I just love the range of books I'm introduced to on your blog. Great Review! I kid you not, your reviews are so beautifully written! HOW DO YOU DO IT?! But anyways... This sounds really unusual and I'm glad you enjoyed it so much. I don't usually consider reading books that are slower-paced but you've intrigued me. Can I just say I adore the word 'metronomic' and I loved how you incorporated it in your review! I'm obsessed with awesome words! It's such a brilliant word, isn't it? I was trying to think of the right word to use and then it just clicked (no pun intended). And thank you so much, I'm glad people enjoy my reviews ha!